It’s always nice to see your baby grow up. Nearly a decade ago, we introduced an AGI script for Asterisk@Home known as CallerID Trifecta for FreePBX® 2.2.0. As sources of CNAM lookups expanded, a number of other individuals contributed code to support those lookups. When we added a fourth CNAM lookup source, the original application morphed into CallerID Superfecta. Then we gave up. The source lookups became too numerous to mention much less name. But all of the original code still resided in a difficult-to-maintain PHP/AGI script. Tony Shiffer picked up the ball and converted the application into a FreePBX module which made it incredibly easy to add new providers and to configure the ones you wished to use. 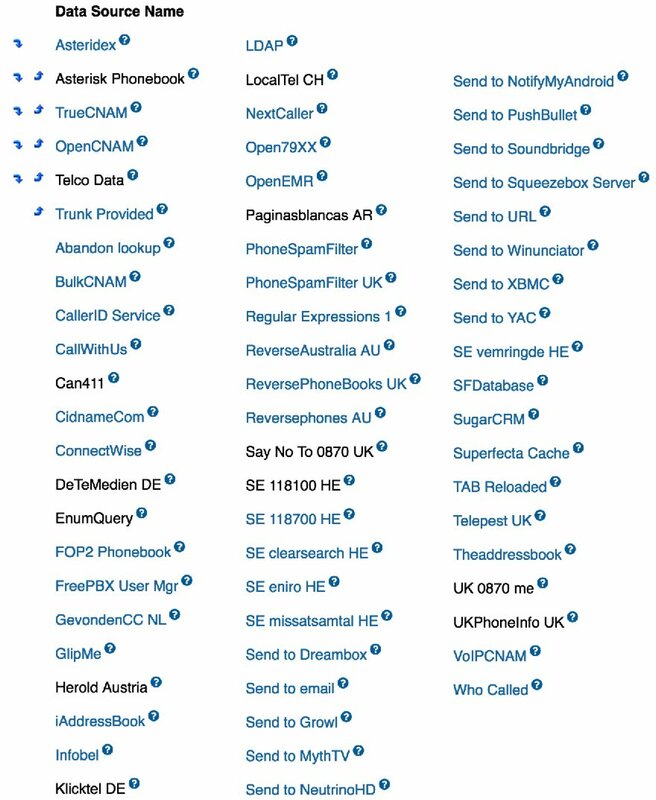 Then Jeremy Jacobs with help from other members of the PBX in a Flash™ Forum community released a real masterpiece, CallerID Superfecta 2.0. Thanks to the efforts of Lorne Gaetz and POSSA, CallerID Superfecta became a truly collaborative, open source project. The number of CNAM sources continued to expand with support for international sources around the world. Then came additional functionality to allow Asterisk® interfaces to XBMC, SqueezeBox, MythTV, and Growl among others. Finally, additions were added to assist in dealing with annoying SPAM calls. Even though CallerID Superfecta has continued to flourish, the number of free and almost free lookup sources particularly in the United States has dwindled as more and more providers cashed in to make their VoIP fortunes. Today, we’re pleased to introduce a new CNAM service, TrueCNAM, that strikes what we believe is a fair balance between free and incredibly affordable commercial tiers with appeal to a broad cross-section of the VoIP community. In addition, James Finstrom has introduced a CallerID Superfecta module for TrueCNAM making it easy to implement and configure. What Do It Do? Let’s start with the basics for those just learning about CallerID. Ma Bell in her infinite wisdom designed a scheme for looking up a Caller Name (CNAM) to match a phone number whenever an incoming call arrived at your home or office. Instead of sending both the phone number and the CNAM down the wire, virtually all providers throw the CNAM portion of the CallerID sent by the calling party in the bit bucket. On the receiving end, the CallerID number is looked up in a proprietary directory to retrieve the matching CallerID name. The problem, of course, is gaining access to these proprietary directories which are maintained by various providers that make a tidy sum charging fees for access. What TrueCNAM does is to access data from carriers and service providers to retrieve a best match for the phone number that is presented. In addition, TrueCNAM has developed its own CNAM repository so that customers can enter names for unpublished numbers such as cellphones. Live traffic flows from carriers, service providers, and end-users utilizing the service. A network of hundreds of thousands of honeypot numbers primarily in North America. Honeypot numbers are telephone numbers that are not connected to an end-user that TrueSpam receives real-time data on. This helps identify many of the most infamous RoboCallers. 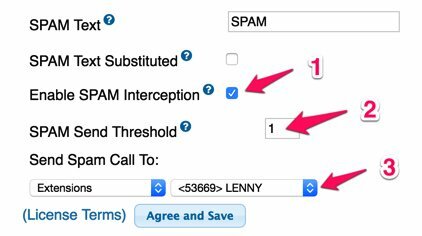 Feedback from end-users indicating a number is or is not spam. Public and private complaint data feeds from multiple government agencies. Additional sources are actively being negotiated. Other third-party sources found to be highly accurate. All of these sources then are aggregated and weighted via an algorithm to produce and update TrueSpam scores in real-time. Most importantly, telemarketing and robocalling numbers frequently are identified and scored within minutes of the first calls. We believe that coupling TrueSpam with CNAM lookups is a terrific addition particularly for business users. And some providers such as CallCentric have integrated TrueSpam reporting directly into their VoIP offerings to block robocalls. Hopefully, others will follow. 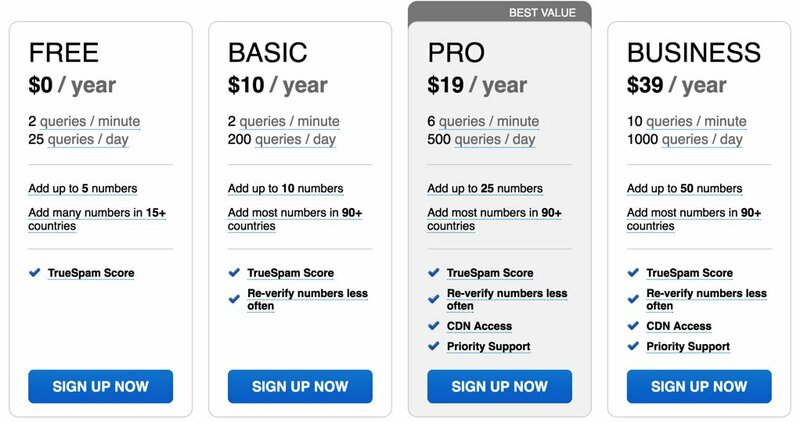 TrueCNAM was kind enough to offer us a Business account so that we could more easily run TrueCNAM through its paces. In a word, it PASSED with flying colors. If you live in the United States, TrueCNAM will become your primary lookup tool based upon both functionality and cost. And Mr. Finstrom’s module for CallerID Superfecta makes TrueCNAM downright irresistible. Once your account is established, log in with your credentials and choose MyAccount -> Account Settings -> API Keys. Click on the Add API Key button to generate your API credentials. Write them down. You’ll need them below. Now log out. Once you have the TrueCNAM module installed and after you’ve set up your TrueCNAM account and obtained your credentials, fire up your favorite Incredible PBX or FreePBX GUI and choose Admin -> CID Superfecta -> Default. Now follow these steps to set up TrueCNAM with your credentials. (1) Find TrueCNAM in the listing of Superfecta modules and click the Enabled button. (2) Use the UP icon beside TrueCNAM to drag it up near the top priority slot for CallerID Superfecta. Personal directories should still take precedence. (3) Click on the TrueCNAM label to open the Settings menu for the Module and enter your APIkey and Password from your TrueCNAM registration. (4) Unless you know what you’re doing, leave TrueSPAM checked with the Threshold set at 80. (5) Click the Submit button to save your credentials. (7) Click Agree and Save to store your Default Superfecta setup. Both Incredible PBX and the FreePBX GUI manage CNAM lookups as part of the Inbound Route setup. If you have multiple inbound routes, then you have to enable CallerID Superfecta on each route on which you want it activated. It’s important to note that you do NOT want to activate a CID Lookup Source AND Superfecta CID Lookup on the same route! So the CNAM setup for each inbound route should look something like the following. Enjoy! Has the issue with "Privacy Manager" been fixed?…. prior versions did not operate correctly with privacy manager enabled with CallerID Superfecta (i.e. blocked/masked CallerID would get through). That’s why I enabled privacy manager.